vs S U P P L E M E N T T O T H E W I N N I P E G F R E E P R E S S | S AT U R D AY, S E P T E M B E R 1 2 , 2 0 1 5 | V i e w o n l i n e a t w i n n i p e g f r e e p r e s s . c o m / p u b l i c a t i o n s The Winnipeg Free Press is proud to present your guide to everything Blue Bombers. 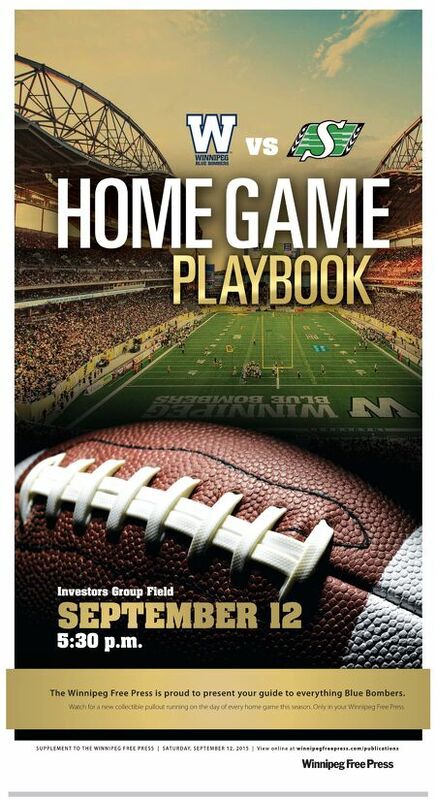 Watch for a new collectible pullout running on the day of every home game this season. Only in your Winnipeg Free Press. Investors Group Field 5:30 p.m.